How many aircraft total are making the return flight? I am a retired 4th grade teacher from Denver. I now live in Orlando and I am wondering if you will be doing a Cocoa beach fl-by as is ocassionally done when an orbiter returns to the processing facility via 474. If so, do you know how I might find date and time for such an event? I spent over 20 years igniting my students interest in the Shuttle Program – – and would love to have a chance to see this if in fact it might occur. Thanks for your posts. I am wondering once you leave El Paso, will it be possible to do a fly over at JSC, Houston? May I please ask how you get the shuttle up on to the plane? And how is it unloaded at the end of the trip? While they cannot publish flight information in advance, you can track their progress on FlightAware. Today’s flight number was NASA911. Not sure if tomorrow will be NASA911 or NASA912 but probably one of them. You can guess if it will be coming near you and when. I am ready to pull my kids out of school tomorrow if they head towards Ellington. I found the answer to my query by going to ‘browse by topic’ then ‘piggy back’ on this page! Thank you for your seriously great blog, Dan. 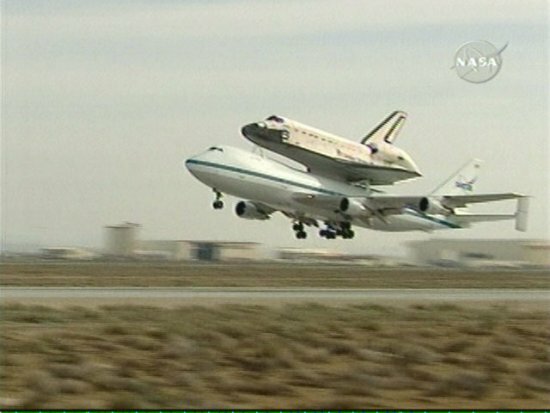 While walking in the desert this morning I saw the landing of the piggybacked Atlantis. I have been waiting for this moment for more than 10 years. The sad thing was the absence of my camera. My photography said he would feel naked without his camera and in moments like this I feel the same. I managed to get to the fence a few minutes later, with proper ammunition: a 300mm zoom lens. If anyone was to follow a shuttle mission from begining to end, STS-125’s was the one program to be a part of and Hubble’s repairs. 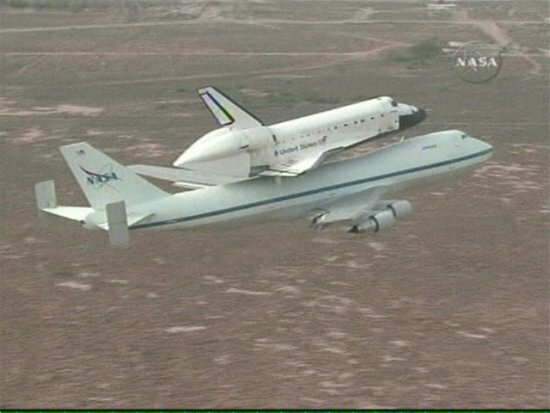 NASA did exactly that with video and pictures and this wonderful blog recording Atlantis’s journey back to KCS from Edwards.